Established in 1996, Pucklechurch Sports YFC is a FA Charter Standard Club that currently runs four teams, under 10s, 13s, 14s and 15s. They play in the Hanham Minor League and the Avon Youth League. This year, (2009/10 Season), we have more than 60 players signed up to play. The Club is committed to providing a safe and friendly environment for young people to enjoy and play football. We strive to create an identity of which they can be proud, whether that is by providing kit, facilities or equipment. We operate an equal opportunities policy and we make all possible effort to keep costs to individual players down so that participation and inclusion is not down to financial circumstance. Each team trains at least once per week throughout the year and between September and March/April they play weekly competitive matches against other local teams. A “Man of the Match Trophy” is awarded to an individual player, per team per week, irrespective of whether the team has won or lost – our ethos is based on the power of positive encouragement!! Players develop a deep sense of commitment to the club, playing week in, week out, whatever the weather. Training on dark winter evenings keeps them out of mischief and gives them a sense of purpose! 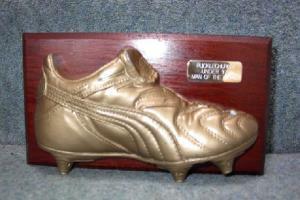 MOTM trophies vary between teams but are much coveted by all those who receive them! Each trophy is returned to the team manager at the end of the week ready to be awarded to a new recipient. Pucklechurch Sports YFC is run by a Management Committee of volunteers comprising: Honorary Chairman, Honorary Secretary, Honorary Treasurer, Honorary Fixture Secretary, Child Protection Officer, and the managers of each team as well as agreed Lifelong Members. The Club is an Affiliated Member Club of the Football Association by virtue of its affiliation to/membership of the Gloucestershire Football Association Ltd (Youth Section). We fully support and abide by the Football Association’s Child Protection Policies and Procedures, Codes of Conduct and the Equal Opportunities and Anti-Discrimination Policies. All team managers are at least Junior Manager Level 1 qualified. The Club organises a number of social events each year – most with a strong emphasis on fundraising! These include special training days, barbecues, quizzes, trips and auctions. At the end of each season we hold an Awards Evening. Every player receives a trophy to reward participation and three special awards are made per team: “Sportsman of the Year”, “Player of the Year” and “Most Improved Player”. This enhances team spirit, improves self-esteem and encourages continued regular participation. Managers and players develop a deep sense of pride in their team as well as in individual achievements. At present the club requires a “signing–on” fee of £10 per player. Funds are raised through match subs. (currently £5 per match) and other fundraising activities. Kit is provided free of charge to all those who play – we actively seek sponsorship towards the provision of new kit as and when it is needed. The Management Committee maintains a Club Code of Conduct, which outlines the ethos of the club and the behaviour expected of all club members. It includes undertakings by managers, players and parents regarding behaviour. All Club members must agree to abide by the code. Breaches may invoke disciplinary procedures including the expulsion of any member if the Committee deems it not to be in the best interests of the club for them to remain.